I come to you today with my favourite dish of all time. Which might be a shock to many of you reading this who, given my numerous and indiscreet professions of love for pizza on this blog/Instagram/in real life (hey, mom), probably assumed I was a pizza-or-die kinda gal. And I typically am. I would do bad things for pizza. 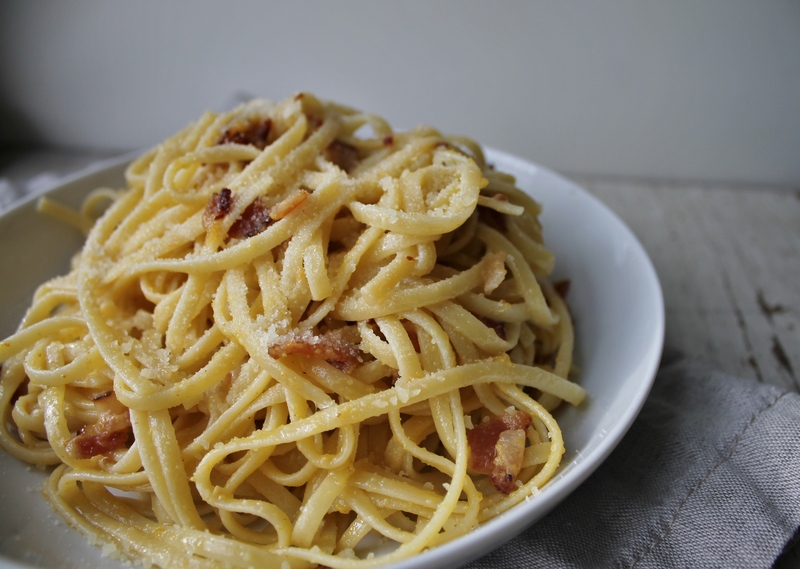 But I would give up my firstborn child and even wear crocs for this carbonara if I had to (though I can’t quite imagine a situation in which that would happen, just appreciate the figure of speech here). 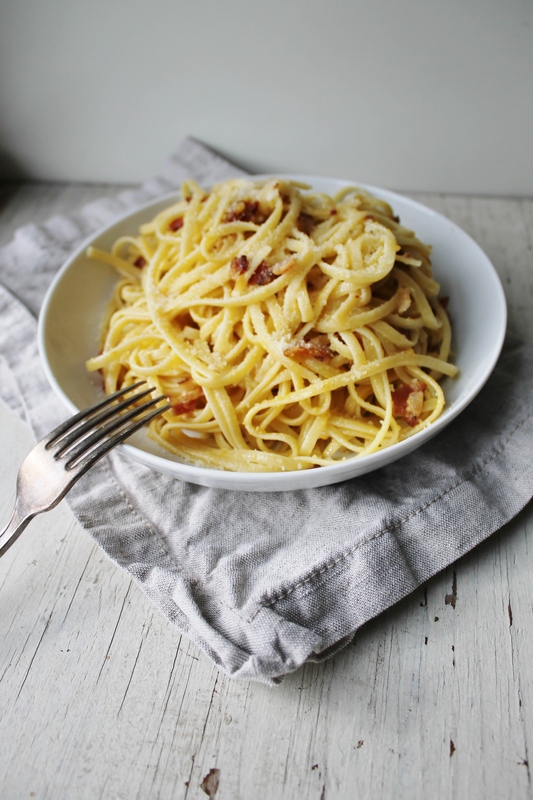 Pasta alla carbonara –or more traditionally, spaghetti alla carbonara- is an absolute miracle of a dish combining three of my fave things: bacon, carbs, and cheese. It’s probably a heart doctor’s nightmare on a plate, but I’m 21 years old and recently drank a green juice, so let me live. I grew up in Italy and also grew up an extremely picky eater who once cried when presented with an eggplant and blamed it “on my contact lenses”, so whenever we would eat out I basically rotated between this, pizza, or lasagne to avoid contact with vegetables or suspect seafoods. 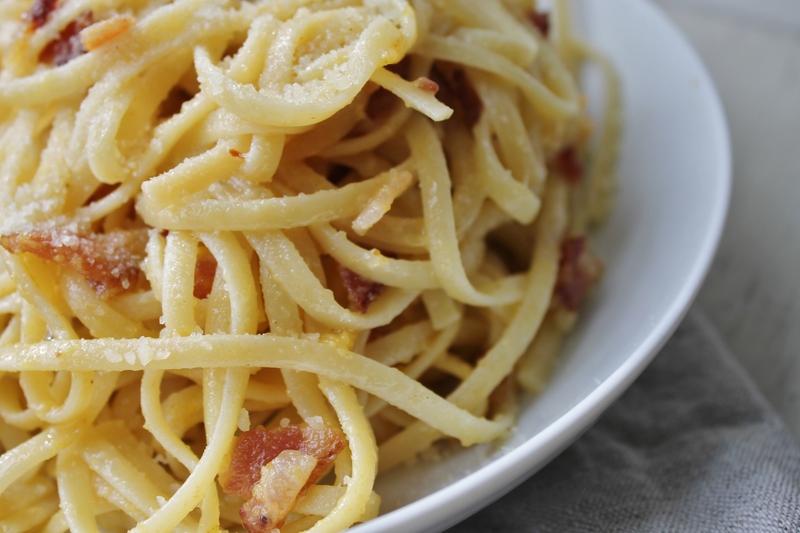 So it’s safe to say I’ve ingested my fair share of carbonara, but this recipe by my mother (QUELLE SURPRISE) takes the cake once again. This recipe is surprisingly simple and results in the perfect comfort food. I don’t know what else I can tell you to convince you to try this short of showing up at your houses individually and coming at you with forkfuls of this pasta, but that’s both impractical and illegal so just trust me when I say you NEED TO MAKE THIS. Heat oil in a medium pan and add pancetta. Add pepper flakes, salt, and pepper to pancetta, stir, and let cook. 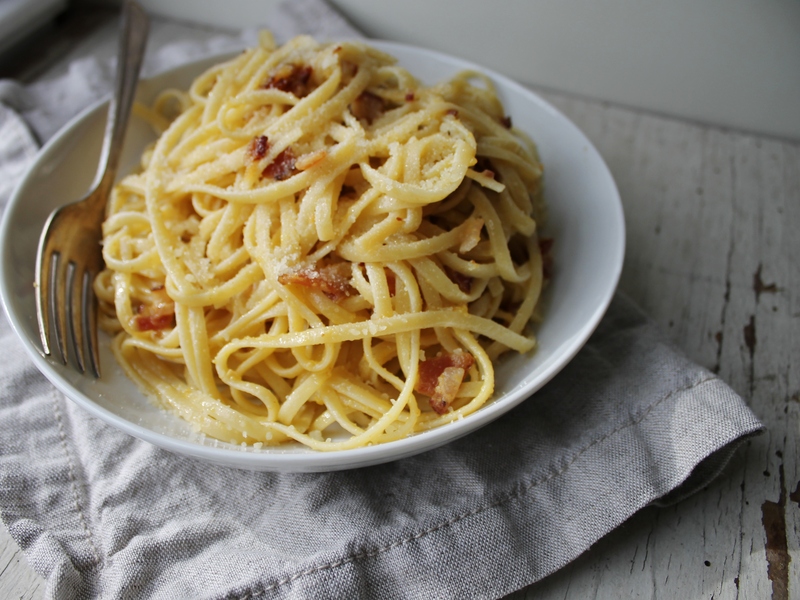 Chop garlic and stir into pancetta, then cook until the pancetta is slightly browned. When the pot is boiling, add a dash of salt then toss in the pasta. Before draining, take out 1/2 cup of the cooking water (aqua di cottura) and set aside. In a small bowl, beat egg yolks. 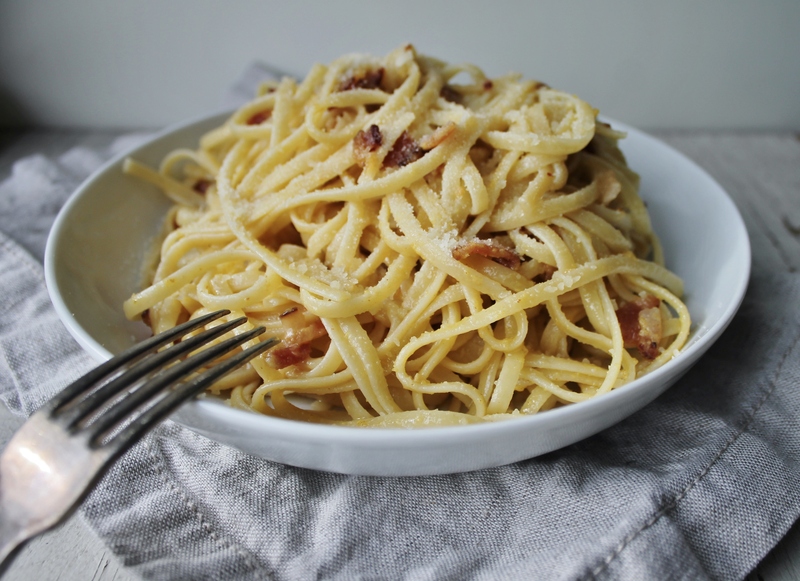 Put pasta and pancetta back in pot and combine well. Slowly mix in the aqua di cottura into the egg yolks, beating steadily to temper the eggs and not scramble them. Add egg mixture to the pasta and stir until there’s no liquid tat the bottom of the pot. Add cheese and serve hot. This looks amazing! As an Italian myself, I have to say this looks spot-on with my own mom’s recipe! Must be an Italian mamma thing 😉 Pinning! This looks insanely good. I’m right there with you as a lover of all things carbs, bacon, and cheese.